This is the very first of my old slide film shots I had transferred to digital. I had an enlargement of this made, first as a birthday present for my father many years ago before digital cameras were ever dreamed of, then along with 4 different old shots, I had this one made as enlargements so I could give them as a birthday present to my best friend Scott, who helped me buy my D300 in 2007'. I could never have afforded that camera without his oh so generous, and unsolicited help. 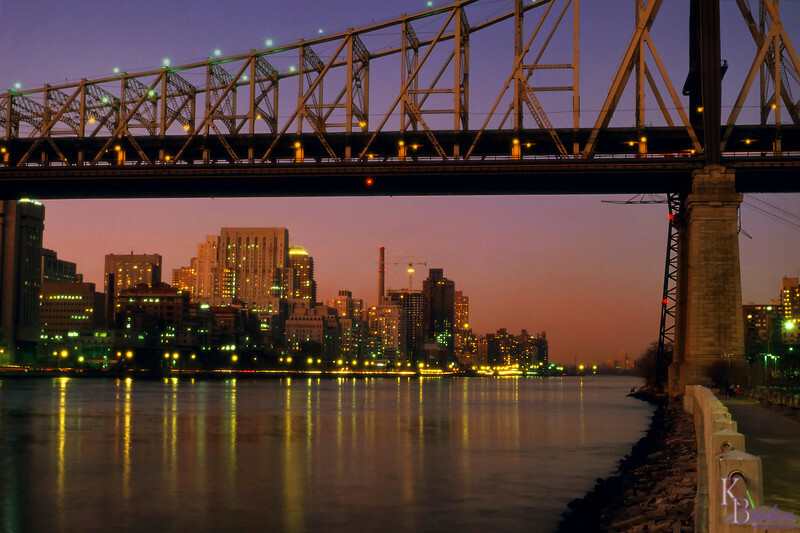 On a nippy March evening just before sunset in 1987, I ventured out to Roosevelt Island with my F3 camera. It was a refurbished model which I had purchased at the Nikon house located in Rockefeller Center for about $900 bucks, probably around a month or two earlier. To get this composition I had to drag my large and very heavy Cullmann tripod along for the subway ride, then over on the "Tram" to the "Island", instead of bringing either of my lighter weight Slik tripods. (Tripods weren't made of as light a material 25 years ago as they are now.) Besides being heavy enough to support a medium format camera if necessary, it had a special attachment that I purchased which was pretty much like a boom arm that you could crank out over a foot off center from the tripods center column. I wanted the shot to include the railing in the foreground, which would one, create an excellent feeling of depth, as well as frame the city skyline in a perfectly shaped rectangle, which would result in a far, far superior composition than any of the shots I'd taken of this bridge before with my little Nikon EM (my very first camera). To do this I laid one of the tripod legs over the railing, then cranked the boom attachment with the F3 on the end all the way out, then swung the tripod head towards the bridge straight in front of me. Now there was no way to see into the viewfinder for composition with this setup, so I had to switch to my High Eyepoint viewer head, which let you see the viewfinder image from 3 inches away (No words on earth could express how elated I was to have moved up from taking pictures with my Nikon EM to this). It was still quite tricky to climb up on the railing and balance myself so I could look into my highpoint viewfinder and get proper alignment of the buildings and horizon. Since I was using the color coded hyper focal distance markings on my lens to focus, I had no need for the standard range finding focusing screen that I usually left in my F3. So I switched it to a focusing screen that placed grid lines in front of what you were viewing, which was fantastic for architectural or scenic shots, as you could easily line up walls and horizons with the grid lines. As this was long long before digital camera's and Photoshop, if I had a crooked horizon the shot would have been ruined, because when it came to slide film, what you shot was what you got. So without the F3 this shot would have been impossible. Just about everything it possessed that my little EM didn't, allowed me to make sure everything in this shot was going to be perfect. The last obstacle I had to get past was figuring the correct exposure. As this shot was going to be more than one full second, I wasn't going to use the built in meter to judge exposure, as back then camera meters were very easy to fool under even normal lighting situations, let alone add the problems meters had reading long low light exposures on top of that. So I decided to fall back on my experience with other twilight shots I'd taken in the past. I knew under similar lighting an exposure of 1 second, resulted in fine capture of richly saturated colors in the sky, but buildings that were black, and I wanted the buildings and not just their lights to be visible. But I didn't want so much exposure that the sky got washed out. So I spit balled it and tried an exposure of three and a half seconds, with no real assurance that it would work, but it was what my gut told me to try. Though I've taken many wonderful low light scenes since I've gone digital. None have or ever will bring the satisfaction that this shot did. If I failed in any of my calculations, or execution of techniques this shot would have been a failure. Slide film was notoriously unforgiving of mistakes, so I was operating with no net. I was only going to get one shot at a perfect image with this perfect lighting and no planes or the Roosevelt tram finding their way into the scene, and if I messed up, then lugging all that back breaking equipment from Staten Island over here would have been for nothing. Instead it turned out I got the best night time shot I've ever taken, and the one I'm most proud of.